OK, I have to admit, this is getting a bit much, even for me. I love the work that Orlando has been doing on this book, and the art by Watanabe and Jose could not be better. But even so, this issue kind of pushed me to my limits. 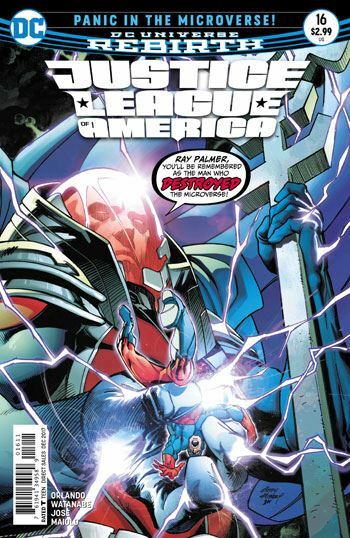 First off, this is an Atom story, not a Justice League one. It’s sort of the second half of a tale within a larger arc, which concludes the explanation of where Ray Palmer has been, and what he has been up to. I had no problems at all with the first half of this story, in the previous issue. In fact, I have to admit, were I reading a comic about the Atom, I don’t think I would have a negative word to say about this issue. But I am not reading The Atom. 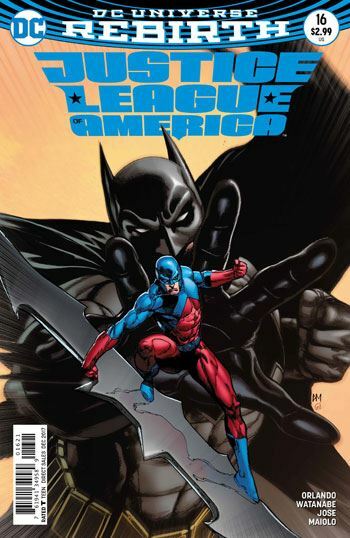 I am reading Justice League of America, and yet only on the very last page do the members of that team appear. In one panel. And none of them even says a word. I know writers are not the ones who decide how comics are published, but it seems to me that this issue and the last one would have been better served as a single, double-sized volume. The overall storyline of the microverse is enjoyable. And yes, this backstory really helps flesh things out. But spreading it over two issues, while not finding time to deal with other members of the team, is now dragging the tale out a bit much. I guess I ought to be thankful that the book is biweekly instead of monthly, or I would probably have lost the flow of the larger arc completely by the time we get back to it. When the story is all over, and one can read it all as a single tale (or as a collected edition) I suspect that the problems I am feeling with this issue will be negated. But having to review this specific issue on its own merit, it just doesn’t hit the mark for me.